The dogs and sled were used very often. 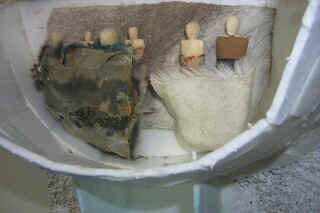 They were one of the main parts of surviving. They used them to hunt - all the time. Sometimes they did get a rest, especially on Sunday. 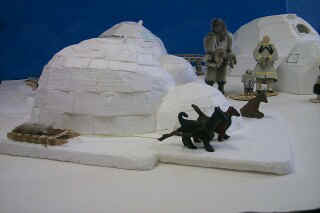 The dogs stayed outside at all times, resting around the igloo. The dogs were also used in the summer when they went to the islands to hunt caribou. They would carry meat, tents, tent poles and other materials. This boat is put up high so as to prevent the dogs from eating the skin off of it, to prevent the frame from being damaged by the snow and to help it dry out after usage. It is called a qayaq. They are used to hunt seals, when there are boats. They used to carry people around inside the shell and on the top. 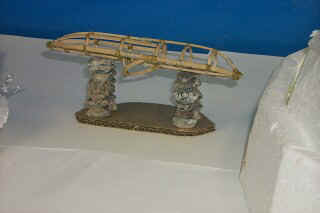 They would use them to carry their family across the bay, for example. 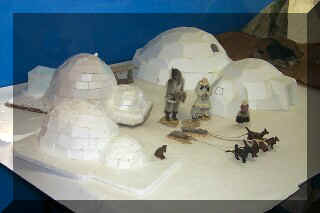 The shell is made of seal skin and the frame is made from wood. 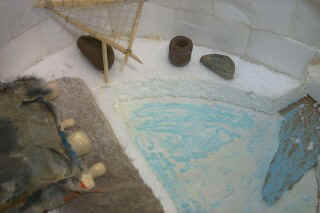 Whale bones were used previously. The Camp is at rest! Used in the winter, the snow is an excellent insulator. 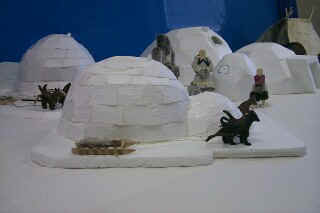 They start with igloos from December to May. 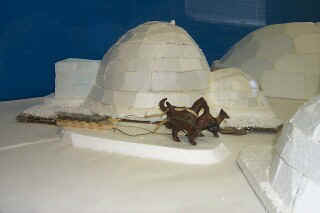 They are made from square blocks of snow. 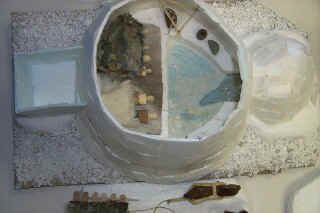 In the more permanent igloo, they are lined with a tent which makes the igloo warmer. They usually have one window and it is made of ice. There are usually three or four quilliqs. The small one is on the floor to keep the floor light. The floor is usually flooded with water which freezes. This will make it easier to clean from blood stains. The bed is higher than the floor, to try and keep it warm. The floor gets frozen, but the bed does not. The caribou skin is on top . These two are using winter clothing. This is seal skin - the pants, parka, seal boots and mittens. They wear this clothing from May to October. This seal skin clothing is not warm enough for the coldest weather. However, caribou skin is also worn and is considered to be warmer clothing for the coldest weather. 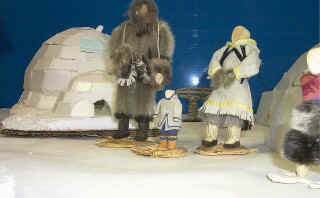 The female clothing is made from caribou skin. 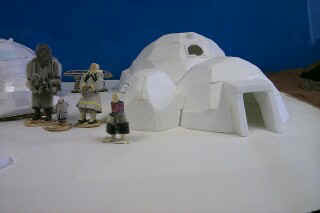 It is called amoutiq and sometimes called atigi because it is made from caribou. An atigi is usually an inner layer of clothing with the fur trimmed and is on the inner side with the skin on the outside. It is also used to carry babies. Her mitts are made of seal skin. The pants are made from caribou skins. 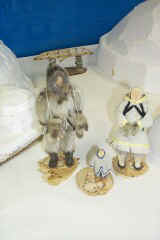 The women used caribou skin because it is considered to be very warm. The boots are called kamiks. 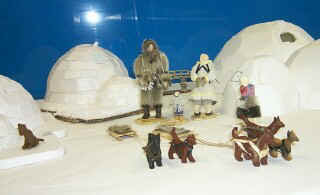 They are made from seal or caribou skin and they are used for the cold winters but are also used during other seasons. 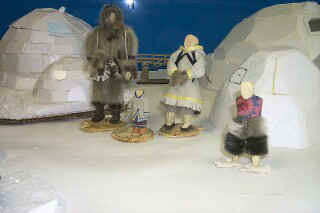 The children also have seal skin but also wear other clothing inside. The fur is on the inside. The boots and mittens are also of seal skin. Everything is ready for the trip and the hunt! If you would like to make comments on our project, just click on the icon above.